We got up, showered, got dressed, and went down to breakfast around 8 AM. We were packed, checked out, and had the car loaded by 9 AM. We headed north on the Ronald Reagan Turnpike, exited at some miles later, and headed west. FL-94 ended at FL-997 where we headed north. In looking at a map later, we would probably have been better off to get on FL-997 right from the hotel. There was major road construction on FL-997 all the way to US-41, but traffic moved along at the 50 MPH posted speed limit. At US-41 we headed west. This is Miccosukee Indian territory, as indicated by the Miccosukee Resort and Gaming facility (Casino) at the NW corner of Fl-997 and US-41. A short way to the west this stretch of US-41 (the Tamiami Highway between Tampa and Miami) is bordered by Everglades National Park on the south and the Francis S. Taylor Wildlife Management Area on the north. It eventually leaves both of these and runs through the heart of the Big Cypress National Preserve. We pulled in to the ENP entrance for the Shark Valley Visitor Center and immediately and got stuck in the line of cars waiting to get in. The parking lot had filled a few cars ahead of us and it was now a one car out, one car in situation. Once we were in we checked out the tram ride to the Shark Valley Observatory Tower seven miles one way due south into the Everglades. It was a two (2) hour narrated round-trip and cost $24 per person ($19 for seniors). You can hike or bike out to the tower for free (after gaining admission to the NP). We did not have that much time so we walked part way down the road along an open channel of water about 15 feet wide and found lots of wildlife photo opportunities, including birds, a large turtle, and alligators. 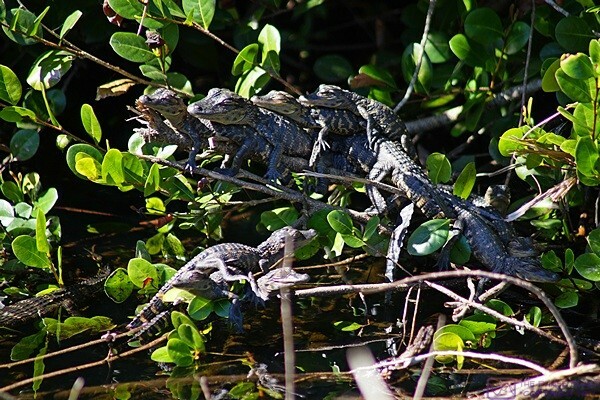 The most interesting thing we saw was a cluster of at least a dozen young alligators, ranging from one to two feet in length, piled up on top of one another. A little farther west we left US-41 and drove a small 2-lane road for 38 miles. The first half was paved and the second half was good gravel. It was a lovely, slow drive with a maximum speed limit of 30 MPH and a few nature photo opportunities along the way. 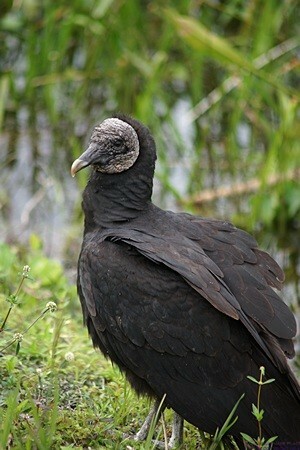 A Black Vulture near the Shark Valley Visitor Center, Everglades NP, FL. After rejoining US-41 we continued west through the Big Cypress National Preserve as far as FL-29 with Everglades NP once again on our left. We then headed south through Everglades City and re-entered the park. The Gulf Coast Visitor Center was very small and did not have the ENP shirts we had seen at the Flamingo Visitor Center and were now hoping to buy. The vendor operated gift store did not have them either. The only things you can do from this point in the park are explore the NW coastal portions by canoe, kayak, or pontoon boat. We did not have time for any of that on this quick visit so we pulled up the address for our RV park in the GPS unit and pushed on. We had a better look at Everglades City on the way out of town and decided that it was an interesting looking little place. A traveling carnival of some considerable size was setting up in the middle of town, literally. Back at US-41 we continued west as we were still somewhat east of the north-south line through Arcadia. The only other route home from here would take us north on FL-29 and then back east on I-75 and eventually back through LaBelle and up the west side of Lake Okeechobee. That would be a much longer trip and it was already starting to feel like it had been a long day. We left US-41 at Collier Blvd. and traveled north about seven miles to I-75 north. Traffic was heavy, congested, and stop-n-go initially but eventually freed up. We traveled about 39 miles to exit 141 at Ft. Myers and headed east a few miles to FL-31. Our final 38 miles were straight north to Arcadia where FL-31 ends at FL-70 just west of our RV resort. From the Shell station in Arcadia on Tuesday morning to our coach at 5:45 PM today we put 919.4 miles on the car’s trip odometer. The speedometer on the car reads slightly high, probably because the tires are not factory original specifications, so our actual mileage may have been slightly less by about one mile for every 60 miles traveled. That would be approximately 15 miles for our trip, making the actual mileage perhaps 905 for the four days, for an average of 225 to 230 miles per day. That’s a lot of driving, but the purpose of our trip was to get a first glimpse at a lot of south Florida that we had not seen before. We brought a few things in from the car, spent some time with our cats, and then visited with Ron and Vera (who did not even realize we were gone), before walking over to Mara’ rig for dinner. Mara made a pot of vegan chili and a wonderful salad which we enjoyed with a glass of her favorite Malbec. We talked about our trip, how the kitties did in our absence, and discussed the logistics of Michael’s upcoming visit. We returned to our coach around 9:15 PM, finished unloading the car, unpacked a few things, adored our cats, and relaxed with our iPads for an hour before going to bed. I was up at 7:30 AM, partially prepped the coffee, and then unpacked clothes and hung them up or put them in the laundry hamper. Linda got up sometime after, after which I ground the coffee beans and finished making our morning coffee. We noticed last night that a few folks had things sitting out in their front yards suggestive of a garage sale. This morning there was quite a bit of commotion outside and we noticed several yards just from our rig with lots of stuff sitting out on tables and/or the ground. Clearly Big Tree Carefree RV Resort was having an official yard sale event today. We had granola for breakfast and then strolled through the resort. Based on one comment we overheard we got the impression that the yard sale might have started yesterday but there was still lots of stuff available. We are not yard sale people, as a rule, and our real destination was the laundry room. Most of the parking spaces were taken but the room was empty and none of the machines were in use. We walked back to our coach, loaded our laundry, computers, and iPads in the car, and drove over to the laundry room. I got the laundry into a washing machine while Linda got her computer going and connected to the park Wi-Fi system. I then started my computer and got online. Her computer screen came up dark. It has done this many times in the past, but not recently. We think it may be related to the battery, but we are not sure. Our main reason for bringing our computers over was to download our e-mails from the last four days. BCM, in particular, has a habit of sending me large files as e-mail attachments or links to large files in a Dropbox, which I prefer. I had at least 118 e-mails but no large attachments. I did not get a count from Linda. Both of our computers are also set up to automatically sync our Dropbox account, and one of the things it does is automatically backup four WordPress websites. We only had 2.5 GB of data left on our Verizon account to get us through February 19th, so we wanted to transfer as much data as possible via the park Wi-Fi system. Once the laundry was dry, folded, and hung, we returned to our coach where Linda put on her swimsuit and then joined Mara at the pool. After putting the clean clothes away I rebooted and reconnected our computers and iPads to our local network and turned on the NAS. Once everything was up and running I connected the camera and off-loaded all of the photos from the last four days; just over 400 total. I got a bite to eat and then put on my swimsuit, gathered up my towel and a pair of dry shorts, and went over to the pool to join the ladies. 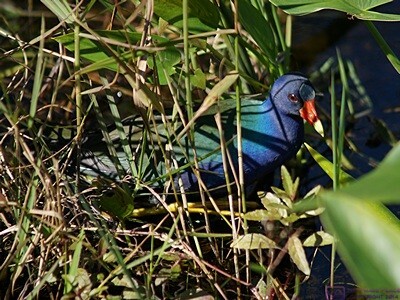 A Purple Gallinule near the Shark Valley Visitors Center, Everglades NP, FL. When I arrived Linda and Mara were sunbathing. The pool was cool even though it is heated but once I was in and swimming gently I generated enough heat from muscle activity to be comfortable. I swam for about 1/2 hour and then sat in the hot tub with the whirlpool turned on and positioned myself to vigorously message my lower back. Linda had taken the soap when she went so I took that along with my towel and shorts and used to shower to rinse off the chlorine and get cleaned up. I returned the soap to Linda and walked back to our coach. I doodled on my iPad while Linda read a book when she returned to the coach. She left at 4 PM to walk to the grocery store with Mara while I laid down on the sofa to take a nap and Jasper curled up next to me. I was aware of Linda’s return, gradually woke up, and finally got up. Linda invited Mara to come for dinner. While she busied herself with the preparations, I went through all of the photos from our trip to Everglades National Park and Key West and backed them up to our NAS. While I was looking at photos ESET Smart Security kept popping up messages letting me know that it needed my attention. I opened it and it presented me with a loooong list of critical and recommended updates. Given our data situation this month I deferred those until I can take my computer back to the office/laundry/activity building and use the resort Wi-Fi system. For dinner Linda made a nice green salad and a “pasta” dish using an edamame and mung bean fettuccine style noodle. Mara came to our coach around 6:45 PM and brought a vegan chocolate mousse for dessert. It was based on blended avocados and it was a delicious finale to a scrumptious meal. There was a nice orange glow in the western sky but it was too dark by then to eat outside. It was also getting chilly following sunset so we ate inside and polished off a bottle of Barefoot Pinot Grigio between the three of us. Mara left a little before 9 PM and we turned on the TV to see if anything interesting was on. One of the PBS stations was showing a three part drama titled Arthur & George based on a true life event in the life of Sir Arthur Conan Doyle and starting Martin Clunes (Doc Martin) as Doyle. Linda went to bed part way through the third episode but I stayed up to watch it as it was very well done. I flipped channels for a while after that but nothing else held my attention and I finally went to bed sometime after midnight. We were still tired from out whirlwind trip to south Florida and slept in this morning. When we finally got up Linda made pancakes for breakfast, this being Sunday and all. It’s a good thing we have our 2 GB of bonus data for the next couple of billing cycles. Between the Windows 10 upgrade on two computers (most of which we did using the RV resort Wi-Fi), the upgrades to the iOS on both iPads, the inevitable updates to applications on all four devices, and quite a bit of work on BCM articles as well as our personal website/blog, we have had to monitor/manage our data usage very carefully for the January 20 through February 19 billing cycle. Even with being gone for four days to the Everglades and Keys, and taking our devices to the activity building to use the Wi-Fi, we will be very close to our limit by this Friday, which is the 19th. There are at least eight alligators in this image and several more outside the frame. Shark Valley Visitors Center, Everglades NP, FL. My computer was indicating that I had 22 updates available which meant that Linda’s computer probably had a similar number. One of them was a Windows 10 cumulative update which I knew would be large so I took both computers to the library and did the updates there. I then spent part of the day processing and backing up photos before turning my attention to blog posts. Even with our data situation I uploaded several from mid-October and prepared several more. We had a relatively easy day otherwise and I did not record all of the details which are now mostly lost to me. Brenda Phelan called around 5:15 PM to let me know our tire and windshield covers were ready but she and Bill were headed out for a couple of days on windshield cover appointments. They would be back on Wednesday and we deferred dealing with delivery until then. For dinner Linda made a mushroom bourginione with macaroni. She used a Lindeman’s 2014 Shiraz to make it and we also drank some before/with our meal. She bought a pint of Soy Delicious Cookie Dough non-dairy “ice cream” the other day and we had that for dessert. After dinner we settled in to watch our Sunday evening TV programs, including Downton Abby. We had our usual morning of coffee, juice, and granola for breakfast. Our fresh water tank had dropped below the 1/3 level yesterday or the day before. The monitor only indicates Empty, 1/3, 2/3, and Full so once it drops below 1/3rd I have to check it visually. Fortunately the tank is translucent polyethylene and is located behind a door such that I can see the water level when the lighting is right. Given how we are parked, facing southwest, the light is best in the morning as access to the tank is from the driver side of the bay. The tank was down to the 1/8th level, which is about 15 gallons. We might have gotten one more day’s use but there was no reason to run the tank dry and the pump works better with a full tank. I dumped both waste tanks and refilled the fresh water tank. I checked the hardness of the water coming out of the softener after the tank was full and it was indicating somewhere between 0 and 1.5 gpg. I updated my Excel spreadsheet accordingly. 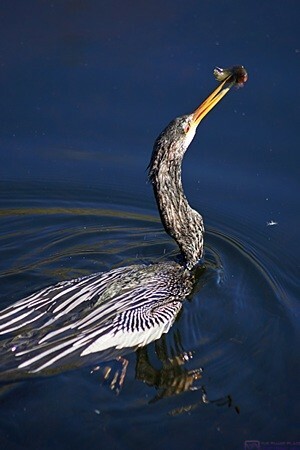 An Anhinga that just caught something to eat. Shark Valley Visitors Center, Everglades NP, FL. Linda had work to do today on family tax returns and set up her computer on the temporary dining table while I continued to work at my computer on the desk. I selected and processed a couple of photos from our visit to Everglades National Park for Linda’s weekly postcard to Madeline. I then selected and processed photos to include in the blog posts for the dates of our visit to the Everglades and Keys. Brenda Phelan had also sent us an e-mail yesterday regarding our tire covers. I replied to that and indicated that we might pick them up on Wednesday when she and Bill are back at their shop in Lakeland. With that done I started preparing for a 3:30 PM telecom meeting of the FMCA National Education Committee. I printed off six documents: meeting notice, agenda/notes, short survey results and sampling information, and the long survey results and sampling information. All told it was 55 sheets of paper, but I wanted/needed to see the survey results printed out. At 3:29 I dialed in and was the first caller, which I though was odd. I doubled checked the meeting notice and realized the meeting was Wednesday the 17th. I knew that, but historically we have always met on Monday afternoons and I just had it in my head that we were meeting today. The upside us that I have more time to digest the data and think about how I want to handle the fact that the sample/response was too small (in my expert opinion) for the results to be considered representative of the FMCA population. We had leftovers for dinner, after which we settled in to watch the X-Files and Lucifer on FOX as our usual Monday evening programs on CBS were preempted by the Grammy Awards, which did not interest us. At 10 PM we switched to PBS and watched a documentary on Stephen Hawking, followed Charlie Rose. Rose’s show was focused on Supreme Court Justice Antonin Scilia, who passed away over the weekend. This entry was posted in Big Tree RV Resort, Computers, Family-Friends-Home, Florida, FMCA, Natl Educ Committee, Natl Parks, NP-NM-NWR, PBS, Photography, RV-Travel, WFPB, Wildlife, Wine and tagged Alligators (ENP FL), Android app updates, Anhinga (ENP FL), Arthur & George (PBS), Big Cypress Natl Preserve (FL), Bill & Brenda Phelan, Black Vulture (ENP FL), computer updates, Cookie Dough (Soy Delicious), edamame - mung bean noodles, ESET Smart Security (laptops), Everglades City (FL), Everglades NP (FL), FL-29, FL-31, FL-94, FL-997, FMCA educ survey, FMCA national education committee (NEC), fresh water tank (H3-40), Gulf Coast Visitor Center (ENP FL), Hampton Inn (Homestead - Florida City FL), I-75 (FL), iPad updates, laundry, Lucifer (FOX), Malbec, Mara Culp, Miccosuke Indian Tribe (FL), mushroom bourginione (vegan), Pinot Grigio (Barefoot), Purple Gallinule (ENP FL), Ronald Reagan Turnpike (FL), Shark Valley Visitor Center (ENP FL), Shiraz (Lindeman's 2014), Supreme Court Justice Antonin Scilia, swimming pool (BTCRVR), tire covers, US-41 (FL), vegan, vegan chili, Verizon data plans, Waste Tanks (H3-40), WFPB, Wi-Fi (BTCRVR), Windows 10 updates, X-Files (FOX), yard sale (BTCRVR) on 2016/02/15 by BRF. I set my alarm for 5:30 AM and got up when it went off. I got dressed quietly, fed the cats, refilled their water fountain, and took my allergy pill and B-12 vitamin. I used a plastic bag to pack a change of underwear and socks, a basic oral hygiene kit, my iPad, my checkbook, and my phone charger cable. I loaded my travel bag and walnut pieces into the car and then checked the mousetraps in the pantry. One of them had two mice in it. It was still pitch dark outside so I drove to the end of the new driveway, parked with my headlights pointing across the road, took the trap to other side of the road, and released them. They went scurrying off into the thick undergrowth of the woods and I drove back to the house. I left the trap on the front porch and went inside to wash my hands. I finally left on my road trip to Indiana at 6:20 AM. I needed fuel so I headed south on Hacker Road and stopped at the Shell Station on Grand River Avenue at I-96. There is a Dunkin Donuts co-located with the station so I got an extra-large coffee and was on my way. I decided to head east a couple of miles on I-96 and then south on US-23 to Ann Arbor where I picked up I-94 west. I took I-94 as far as I-69 and then headed south. Somewhere along this segment I realized I had forgotten the box with the two swivel ring bearings. That meant I would not be stopping at Coach Supply Direct in Edwardsburg, Michigan to return them, which would save me time but necessitate getting them back to Josh another time and/or another way. The change in plans would loosen up my schedule a bit but I still had four stops to make and was anxious to make time. I stayed on I-69 south into Indiana and then took the Indiana Toll Road (I-80/90) west. Traveling west there is one travel plaza between I-69 and the SR-19 exit. I stopped there to use the restroom and get another cup of coffee. Back in my car I called Josh to let him know I would not be stopping by his shop today in Edwardsburg. I then called Linda to update her on my whereabouts and change in plans. She said she would take care of getting the box with the swivel ring bearings ready to mail. The weather was overcast, drizzly, cool, and windy when I left this morning. The winds were out of the west so I had a crosswind or a headwind for the entire trip down. By the time I reached Indiana I had driven out from under the cloud cover. The temperature remained very cool but the sunshine was refreshing. My first stop was A-1 Upholstery in Elkhart, Indiana. Much to my surprise Terry had used the exact same fabric for the filler cushion that we had her use for all of the other ones, so it was a perfect match! I got a call from Josh while I was there and called him back as soon as I left, but got his voice mail. My next stop was at Pat and Vickie Lintners’ house, about three miles from A-1 Upholstery, to pick up a critical accessory piece for the built-in Nutone multi-function kitchen appliance. We have a functional power base built in to our kitchen counter in the bus but only had the blender attachment. Vickie gave us a number of other attachments at a rally back in September but many of them required a right angle tower adapter. She had found the adapter a few weeks after the rally. From Pat and Vickie’s I backtracked to the main north-south road, went south back over the St. Joseph River, and headed west on Old US-33 (Lincolnway). I got a call back from Josh and he said to stay on my current road all the way to the Mishawaka bypass and then head south to US-20. From there I was on familiar road as I headed west to US-31 south. Michele Henry from Phoenix Paint had called while I was at Pat and Vickie’s and I let it go to voice mail. I called her back when I was done talking to Josh. They had both called me with some recent scuttlebutt about a service facility in Elkhart where friends of ours had some major remodeling work done on their vintage bus, but it was also a chance to catch up on things in general and helped pass the time as I drove. I stopped in Argos for fuel and called Bill Tharpe with an ETA of 12:30 PM. I then called Jarel to let him know I would be there by 1:30 PM. Butch had driven me past Bill’s place once some time ago so I had a fairly good understanding of where it was and what it looked like; not that I needed it. Given the address my Garmin 465T GPS unit took me right to Bill’s place on Mexico Road south of Mexico and north of Peru. Sounds like I was in Central America. Bill was outside waiting for me and we unloaded the antique SUN Electric Distributor Tester from my car and into Butch’s truck, which Bill had for the winter. He was headed to his building in Wabash, where he has a paint booth, to repaint the truck so we did not chat for very long. Besides, I still had one more stop and it would take at least a couple of hours. A couple of miles on down Mexico Road I headed west on US-24 towards Logansport and arrived at Jarel Beatty’s cabinet shop at 1 PM. Jarel was not expecting me until 1:30 so he was in the middle of cutting dados in side panels for a tall cabinet. When he finished that task he switched to a regular blade in his table saw to work on my pieces. We selected the most suitable pieces of walnut from among the ones I brought. He ripped two pieces, one 2″ wide and the other 2-1/16″ wide, and crosscut them to 19-11/16″ long. He then ran them through his shaper to round off the edges. He changed the blade on his table saw, reset the depth of cut, and set the fence to cut off the amount of material I had marked with blue painter’s tape on the bump out for the passenger side HVAC duct cover. With the sawing done he sanded the two new pieces and then sprayed them with a Sherwin-Williams pre-catalyzed lacquer. He let the first coat dry for 15 minutes and then lightly sanded it with 220 grit paper to knock down tiny bubbles and splatters. He then applied a second coat. It was remarkable to see how it changed the appearance of the wood. Jarel described it as being like “putting water on a rock” and I thought that was an apt description. After another 15 minutes the pieces were dry enough to be transported without damaging them. I wrapped things up with Jarel, including finally remembering to get all of my drawings back, and was ready to leave at 3 PM. The GPS said I would be home by 7 PM, quite a bit earlier than I expected when I left this morning. I had smooth sailing until I encountered a major traffic jam on I-96 eastbound just east of US-127 on the southeast corner of Lansing, Michigan. It took 45 minutes to go three miles and I was sitting at about 1/8 tank of fuel. Ugh. There turned out to be multi-car accidents in two separate locations about a mile apart plus a car stopped in the right lane that appeared to have run out of fuel. What a mess. Once I was clear of the accident area it was clear sailing once again. I stopped at the Marathon station at the Fowlerville exit (#127) for fuel and checked out the truck pumps. Although there were lots of semi’s parked there for the night I was disappointed to find that the back lot was in as bad a shape as the Mobil Truck Stop at exit 117. Still, the round trip from our house would be 20 minutes shorter and it was an alternative place to get fuel. The closest place to our house where we can fuel the bus is actually the Marathon station on Grand River Avenue at I-96 in Brighton, which has truck pumps around back, but we have some low branches in the southbound lane of Hacker Road just before we get to Grand River Avenue, so we tend to avoid that route and that stretch of Grand River Avenue is often very busy and not someplace I want to be with the bus unless it is later at night. I checked the mousetrap in the pantry when I got home and we had caught yet another mouse. I unloaded the car and then took the mouse trap to the end of the new driveway and released it across the road as I had done with the previous four. As I walked down the driveway it was obvious that Phil had been here with his bulldozer, which Linda confirmed over dinner. The “parking pad” area is now presumably level but it was definitely not flat as it had deep marks from the bulldozer treads and ridges where the gravel had not been completely smoothed out. The top inch or so also seemed very loose. I don’t think Phil is done working on the project as he still needs to spread straw over all of the topsoil that he placed, graded, and seeded the other day. I suspect that he still needs to compact the gravel one last time with his track loader but I won’t know for sure until I can talk to him. Dinner was chili and crackers; simple but delicious. It had been a long day but I had taken care of four things in one trip, three of which were directly related to the bus and two of those of a somewhat critical nature. We were both off to bed not long after dinner. Tomorrow was our weekly ham radio breakfast so we would have to be up early to get there on time. This entry was posted in Bus Projects, Family-Friends-Home, Indiana, Michigan, Projects, RV-Travel and tagged A-1 Upholstery (Elkhart IN), antique Sun distributor tester, Bill Tharpe (Mexico IN), built-in sofa (H3-40), Coach Supply Direct (Edwardsburg MI), driveway extension (Phil Jarrell), Food Center (Nutone), I-69 (IN), I-69 (MI), I-80/90 (IN Toll Road), I-94 (MI), I-96 (MI), Jarel Beatty Cabinetry (Logansport IN), Lincolnway (Old US-33 IN), Marathon station (I-96 MI Ex 127), mice (house), Mishawaka bypass (IN), Pat & Vicky Lintner, pre-catalyzed lacquer (Sherwin-Williams), road trip, Terry (A-1 Upholstery), US-20 (IN), US-23 (MI), US-24 (IN), vegan chili on 2015/11/13 by BRF. Today was windshield day. A week or so ago Chuck made appointments for both us to have windshields replaced on our buses by the local Safelite franchise. Chuck knows Scott, who now has a management position with the company, and arranged the work through him. The appointment was nominally from 8 AM to noon so Chuck was at his shop before 8. We figured it would take a while for the crew to do his two lower windshields so I got up around 7 AM but did not have coffee or breakfast. I finished yesterday’s blog post and then went through my final departure tasks starting at 8:30 AM. I texted Chuck at 8:45 AM and pulled out of our driveway at 8:50 AM, figuring that was late enough to miss most of the morning traffic headed into the northwest corner of the Detroit metropolitan area. Chuck texted back that I could take my time as the crew had not shown up yet. The first raindrops came as I was pulling out of our driveway. As I pulled out onto Hacker Road I had a clear view of dark clouds to the northwest. Although my destination was 20+ miles to the southeast I headed north towards M-59. The shortest route would have been south, and gotten me quickly onto pavement, but there are some low branches before the road ends at Grand River Avenue so I do not go that way. From Hacker and M-59 the shorter route would have been east to US-23 and then south to I-96 but that interchange is a left exit, left entrance in the middle of an extensive construction zone; not the sort of thing I wanted to deal with in the bus. So I waited patiently for a break in the traffic and then headed west on M-59 towards the storm clouds. A guy heading east had to slow down while I pulled out a flipped me off as he went by. I hope he had a nice day. I encountered heavier rain as I traveled west for about four miles. I turned south onto Latson Road and drove away from the rain, reaching I-96 about four miles later. I headed east on the I-96 and had an easy drive all the way to Beck Road with only an occasional raindrop. Even at this hour of the morning there were traffic slowdowns along the way but no parking lot traffic jams. The Beck Road exit was easy to navigate going south and it was equally easy to position myself for the left turn onto Grand River Avenue. About a mile and a half later I pulled into the parking lot for Chuck’s shop and phoned Chuck to let him known I was there. I knew in advance how he wanted me to position my motorcoach but there were enough vehicles parked in various places that I wanted him to spot for me. I lifted the tag axles, pulled up to the building, and then turned hard to the right. I backed around to the driver’s side to get somewhat parallel to the building and then started angling towards the passenger side. There is space next to the building in front of Chuck’s shop directly across from his large (bus size) overhead door. My objective was to back around into that space and then pull forward steering hard to the left to get lined up with the door. I have done this before and managed to do it again with Chuck’s assistance. Our Prevost H3-40 VIP conversion is surprisingly maneuverable with the tag axle lifted off the ground. There were two Safelite vans there when I arrived and Charlie and Eric were already busy working on Chuck’s lower windshields. Chuck had backed his coach into the shop so I could pull in nose first and get the front end out of the rain if needed. Since there were only two guys, and the removal and installation of one of these windshields is a two man job, I just parked my bus outside and shut it off. I called Linda at home but did not get her so I tried her cell phone. She was at Kensington Metropark walking with Diane. She said we had heavy rain at home before she left and that it was moving towards the shop. I could see the dark clouds to the WNW and it eventually rained bucketfuls, albeit for only a brief time. A couple of years ago Chuck and I went together and bought five lower windshields from Prevost for our H3-40 VIP coaches, two for him and three for me, for the ridiculously low price of $125 each. They were shipped to his shop in a big triple set of cardboard boxes with foam spacers on a pallet and have been sitting there waiting for us to find someone to install them. Chuck decided to use both of his, in part because there were stone chips in the current ones, and in part because he is vacating his shop and needed to reduce the amount of stuff that has to be moved and stored. The existing windshields on Chuck’s coach both cracked rather badly when they were removed, as in multiple dozens of fractures, but did not shatter. Safety glass is a wonderful thing. He was not planning on keeping the old ones but it was obvious that removing a windshield in order to install a new gasket with the idea of reinstalling the glass was probably not possible. Charlie and Eric removed the old gaskets and then cleaned off the frames. Chuck’s old gaskets had been slit at the corners by a previous installer, probably to make it easier to get the gaskets over the glass, but should not have been altered in that way. Chuck had new gaskets and spline material so the guys got one of the new gaskets installed on the frame. It looked like it would be too big but by the time they got it pressed fully into place it was a perfect fit. They lubricated the gasket and set the new windshield in place. After working the top of the gasket over the top edge of the glass they slid the windshield from the outside edge all the way towards the center pillar. Chuck and I were both hungry and thirsty. Since Charlie and Eric were working on his coach I took Chuck’s suburban to Panera for coffee, a muffin (for Chuck) and a bagel (for me). I made the trip twice. I was almost there when I realized that I did not have my wallet and went back to get it. The guys finished installing Chuck’s windshields and went to lunch. We did not leave as we had no idea how long they would be gone. It turned out to be about an hour. When they got back I had Charlie look at my two lower windshields. The passenger side was cracked and definitely needed to be replaced. The driver side had two small rock dings but they were not directly in front of the driver’s seat and not near an edge so I decided to only replace the passenger side lower windshield at this time. I started up the bus, pulled the nose into the shop, and lowered the suspension to make it easier for the guys to work on it from the outside. I pulled in far enough to make sure the front part of the roof was completely inside the building as it is lower than the rest of the roof and slopes forward. I lowered the rear more than the front to make sure any rain that hit the portion of the roof that was outside the building ran to the sides and rear rather than forward and down the windshields. To remove my windshield they removed the spline that locks the glass into the gasket and then managed to get the glass and gasket out as one assembly. The glass already had a 10″ crack when they started and was fractured in 100 places by the time it came out. They cleaned off the frame, which had a lot of crud on it, and then put the new gasket on. The gasket for the lower windshields is reversible and is used on either side. It is not rectangular, however, with the vertical edge by the center pillar being longer than outside edge where the glass wraps around into the A pillar. With the gasket in place they installed the windshield by using large suction cups to pick it up, front and back side, and setting the bottom edge into the gasket with the right edge about four inches from the center pillar. The passenger side mirror was in the way so I had to loosen one of the set screws and swing it out of the way. They used a hard plastic stick with a rounded tip and edges to get the gasket over the outside of the top edge of the glass. Using glass cleaner as a lubricant they then slid the glass towards the center and into the gasket channel. The glass did not slide easily but Charlie and Eric were big, strong guys and it eventually was in place. They then used the plastic sticks to get the gasket out from behind the glass and over the edge all the way around. The last step in the installation was to put Sikaflex adhesive caulk between the frame and the gasket and between the gasket and the glass, all from the outside. They masked off the frame to protect the paint but did not mask off the glass. Gasketed glass installation was not something I knew anything about so it was informative to be able to watch every detail of this process. They had our invoices with them but had to have the office redo mine and e-mail it since I only had one windshield replaced instead of the two we originally scheduled. Chuck and I each wrote them a check. Eric had us sign on his Note tablet and printed our receipts on a portable wireless printer. It had been six hours since they arrived and they had spent five of those working pretty hard. We gave each of them a $20 tip. Charlie and Eric loaded up our three old broken windshields and left. I then backed my bus out and parked it. Charlie wanted it to sit for at least an hour before driving it to let the Sikaflex cure a bit. Chuck locked up the shop and we went to Panera (again) for a late lunch. We both had Black Bean Soup and Chuck had a half sandwich. Barb called as we were finishing our meal and said she was her way to the shop so we headed back. She arrived at the shop just ahead of us and inspected the new windshields on their coach. I then showed her the work we have done on the interior of our coach. We sat around in the shop talking while I waited for the worst of the rush hour traffic to pass before driving the bus back to our house. I called Linda around 5 PM and then left for the drive home, reversing my route from this morning. Traffic was heavy but moved along. Linda heard me pull in the driveway and helped get me positioned. It’s hard to sneak up on someone with a Detroit Diesel 8V92 engine. Once I was parked I shut off the accessory air to the engine bay, disconnected the chassis batteries, and plugged in the electrical shorepower line. Back in the coach I noticed that the refrigerator had come out of the alcove about 12 inches. It had not budged on the drive to/from Edwardsburg and Elkhart but I will obviously have to secure it after all. Dinner was reheated chili and Saltine crackers. When Linda makes chili she always makes extra and freezes it to have on hand for easy heat and serve meals. It is a one pot meal the way she makes it and is as good, or better, left over as it is fresh. Ferman had called while I was gone and let Linda know that he had the Sandstone Corian he needed to build the small table for the bus so after dinner I texted Josh to let him know. I then checked e-mail but did not respond to any. We watched NCIS and NCISNOLA on the big TV in the basement and then went to bed. This entry was posted in Bus Projects, Family-Friends-Home, Restaurants, RV-Travel, Weather and tagged bus windshield gaskets (H3-40), bus windshields (H3-40), Charlie (Safelite), Chuck & Barbara, Chuck Spera (H3-40 Liberty), Chuck's bus garage (Novi MI), Corian Sandstone dining table (H3-40), DD 8V92TA, Diane Rauch, Eric (Safelite), exercise walking (Linda), Ferman Miller (Countertops Plus), heavy rain, Kensington Metropark, Panera (Novi MI), refrigerator installation (H3-40), Safelite windshield installers (H3-40), thunderstorms, vegan chili on 2015/09/29 by BRF. This is really Linda’s post more than mine. Lou and I stayed in camp all day working with our information technologies while Linda and Val went on an explore. I have been using my iPad2 to go through drafts of blog posts dating back to March 1st filling in details, turning notes into complete sentences, and then e-mailing them to myself. I got caught up as far as that goes and then started writing drafts of posts for the last few days. Linda and Val made a day if it away from camp. Linda took our car and drove them to the Queen Creek Olive Mill (QCOM) in Queen Creek, Arizona just beyond the southeast limits of the Phoenix metropolitan area. QCOM is a large olive grove producing 17 different varieties of olives. (Technically it is an orchard as olives are a stone fruit.) The hot, dry desert conditions in this part of the U. S. turn out to be ideal for growing olives. They are harvested by spreading tarps on the ground around each tree and stripping the olives off. Olives that fall to the ground naturally are past ripe and are not used. Once harvested olives are processed within 24 hours. For pressing into olive oil they are simply washed to remove dust and then pressed (ground or milled, actually), pits and all, to extract the oil. The mash that remains is used as fertilizer for the trees. Olives that are destined to be sold whole may be packaged whole in a brine or have the pits removed and replaced with a piece of garlic or habanero pepper and preserved in a brine. QCOM has a restaurant so the ladies stayed for lunch. Val had a chopped Italian salad and Linda had a quinoa and kale salad, both of which they said were ‘excellent’. The Mill also had a gift shop and Linda picked up several things there. It was late afternoon by the time they returned and neither of them felt like cooking so Lou suggested we go out for dinner and try the Chinese restaurant we intended to eat at a few nights ago when we ended up at the Golden Corral. We piled into Lou and Val’s pickup truck and set off in search of Big Wa. Linda had checked the menu online so we knew they had several vegetarian dishes we could probably eat. Lou and Val had been to Big Wa before and knew approximately where it was but Linda pulled it up on her smartphone and guided us in for a soft landing. Big Wa was a small mom and pop Chinese restaurant; the kind we used to patronize a lot back home once upon a time. We rarely go to Chinese restaurants anymore because it is essentially impossible to get anything vegan. We ordered vegetable Kung Pao stir fry and Moo Shu vegetable dishes. We suspect that chicken broth was involved in the stir fry and I think the Moo Shu, which was already made up when it came to the table, contained eggs. We rarely stray from our chosen diet and although doing so doesn’t kill us our systems do not always react well either. In this case our dishes were mostly vegetables and it was very tasty. We stopped at Home Depot so I could look for a GE Water filter cartridge and then stopped at Walgreen’s so Val could pick up some things. It was well past dark by the time we got back and we retired to our respective rigs for the night. Linda and I watched some TV (Big Bang Theory) and she played online word games while I responded to some e-mails. Linda liked Queen Creek Olive Mill well enough to enter it in the RVillage Marketplace and recommend it. A panorama of our motorcoach parked at RVillage World Headquarters in Arizona City, AZ. Linda was awake by 6 AM and read quietly in bed. I was awake before 7 AM and got up, put on my sweats, and made a pot of coffee. Our two cats climbed up on us to be adored and when they’d had enough of our attention we had some granola for breakfast. Linda got our last bag out of the freezer so if we want this to last until we get home we will not be having it for breakfast every day. Linda is also way overdue for a haircut but I am not about to attempt that. She and Val had planned to go to the mall in Casa Grande today anyway, so she did a quick online search and located a hair salon at the mall. She assembled a short shopping list and added the haircut to it. While they were gone I pulled together all of my blog post drafts for the period before, during, and after the Escapees RV Club Escapade rally into a single Word doc and attached it to an e-mail to Lou. He plans to use it as the starting point for an article about the Escapade in the next edition of our SKP Photographers BOF newsletter. Lou and I needed a break from working with our technology so we put two of our camp chairs in a shady spot with a nice northeast breeze and just sat and relaxed and chatted. Lou asked about the barn we plan to build and I described the three approaches I am considering. We were still doing that when the ladies returned home late in the afternoon. They had both done some shopping so I helped carry bags of stuff into our rig. Linda made a nice salad for our dinner and Val heated up leftovers for them. There is a period of time in the late afternoon when the sun shines into the covered porch of the house and is so hot it us uncomfortable to sit there. Small ants have also appeared with the hot weather so we ate inside at the dining room table. We lingered for a long time talking before finally retiring to our rigs for the night. Curtis got a good deal on this Fleetwood Bounder. He plans to put it in a rental pool. I made arrangements on Friday for us to visit with Larry and Orene Brown today. We left at 10 AM to drive to their place northwest of Florence, Arizona. Larry and Orene are members of both FMCA and Escapees and belong to the Freethinker groups of both clubs, along with several related RVillage groups. We crossed paths with them most recently at the Escapade and agreed to get together after we returned to Arizona City. We stopped briefly in Coolidge to buy flowers at the local Safeway and arrived at their place in the Del Webb (Pulte) developed Anthem communities at 11:10 AM. Larry and Orene are also active in SKP Chapter 8 — Mexican Connection, and will be the wagonmasters for the Chapter’s February 2016 caravan/rally to Puerto Penasco, Mexico on the mainland shore of the Sea of Cortez. We have not had any desire to travel to/in Mexico, but after chatting with Larry and Orene at Escapade we became intrigued with the possibility of traveling with a good sized group and wanted to know more about it. Larry gave us a tour of their house and Orene poured small glasses of wine which we enjoyed sitting outside under their Ramada. Orene made a green salad and vegan chili for lunch. Both were delicious and enjoyed with some iced tea. By the time we were done eating the air temperature had warmed past comfortable so we went inside where Orene served fresh strawberries and cantaloupe for desert. We spent the rest of the afternoon in pleasantly stimulating conversation on a wide range of subjects including, but not limited to, the outing to Mexico next year. We got a lot of important insights, most of which furthered our interest in going. We have enjoyed getting to know everyone from our Freethinkers chapter we have had the opportunity to meet and hope to cross paths with Larry and Orene many times in the years to come. As we wrapped up our visit at 4 PM I got a call from Curtis letting me know that he would probably be arriving tonight between 11 PM and midnight unless he decided to pull in to rest area, in which case he would arrive early tomorrow morning. Either way it meant that Lou would have to move their 5th wheel trailer so Curtis could park his bus in its usual place. It also meant someone, most likely me, would have to open the gate when he got here. I tend to stay up late anyway, but we would obviously do whatever was required to get him in and settled. As we were getting back to our encampment around 5:30 PM Linda called Lou to have him open the gate. After we were in and settled we let him know that Curtis would be returning late this evening. They were in the spot where Curtis parks his bus, so before it got dark Lou hitched up their 5th wheel and pulled it around 180 degrees to the east side of the driveway and pointed towards the gate. He plans to take their rig to Casa Grande tomorrow morning to buy some tires for the truck and the trailer and have them installed so the rig is positioned for an easy exit. Another view of Curtis’s Bounder. Since we knew at 4 PM yesterday that Curtis would be returning late last night, Linda started doing several loads of laundry as soon as we got back to camp. We watched TV and snacked for dinner while the loads washed and dried. She took the last load out of the dryer around 9 PM and we then folded clothes and made the bed. She turned in while I waited up to let Curtis in the gate. I slept in until 8 AM his morning and finally got up when I heard (and smelled) the grinding of coffee beans. Breakfast was toast and fruit juice. As planned, Lou and Val left around 9:30 AM to take their truck/trailer to Discount Tire in Casa Grande. He needed two tires for the truck and two for the trailer. Although Curtis did not leave Pomona, California until 4 PM yesterday he managed to make the 400 mile drive back to Arizona City in seven hours. In spite of what was obviously a long day for him he was up and working this morning, although we did not see him until later than usual. Launching a company is exciting but hard work. Linda sat at the outside table and chatted with Curtis while I worked on blog posts at my computer in our bus. By 11:45 AM the temperature in the bus was 85 degrees so I turned the generator on, turned on all three air-conditioners, and closed up the coach. That kept it cool enough for the cats but I decided to take my computer into the house and work at the dining room table as the house is air-conditioned and quite comfortable. I had copied all of the posts for January 15 – 21, 2015 into a single Word doc but by the time I finished editing it I decided it was way too long so I split it back up into individual daily posts. The other reason for doing this was that this was a very busy week during which I took a lot of photographs. I managed to upload posts to our WordPress blog for the 15th through the 19th. It was a small dent in what I need to accomplish, but it was something. Val brought over a glass of fresh squeezed lemonade at 4:30 PM. By that time my computer battery was run down a bit and I was tired of staring at the screen so I took the computer back to our bus and plugged it in and then joined the others on the veranda to enjoy my glass of lemonade. Although it gets pleasantly cool after the sun sets, and a bit chilly by sunrise, the hot days have brought out ants and midge flies, compounding the notion that we have probably lingered a bit longer in southern Arizona than is ideal. On the other hand, we are experiencing this for ourselves rather than trying to understand it second hand. Also, highs in the mid-to-upper 90’s are not typical for late March in this area, running 15 or more degrees above normal. That is the old (historical) normal, of course, not the new normal. Curtis eventually rejoined use around 5:30 PM. We asked if he wanted to go out to dinner but he was not up for it so we all made and ate our own dinners. While Linda was cooking and I was wrapping up a conversation with Lou and Curtis I got a call from Butch Williams. He and Fonda had just arrived home having driven all the way from the Wal-Mart in Forest City, Arkansas. That same drive took us two days on the way out west in December. It was 7:30 PM here and 10:30 PM there. Linda had the TV on while she was cooking and we watched NCIS Los Angeles and other Monday evening programs during and after dinner. She made a red beans and rice dish and added greens (kale) and crushed red pepper flakes which definitely kicked it up a notch. I continued working on blog posts while half paying attention to the TV programs. One last look at Curtis’s new Bounder. As March draws to a close so does our time in Arizona. We have, and more specifically our motorhome has, been here since December 11, 2014 when we drove from the Escapees Dreamcatcher RV Park in Deming, New Mexico to the RoVers Roost SKP CO-OP near Casa Grande, Arizona. From there it was on to our winter “home” in Quartzsite where the bus remained parked until March 3rd. On March 3rd we said our “so long, see ya down the road” to Butch/Fonda, Jim/Barb, and Jim Liebherr, our host/landlord while we were in Quartzsite. 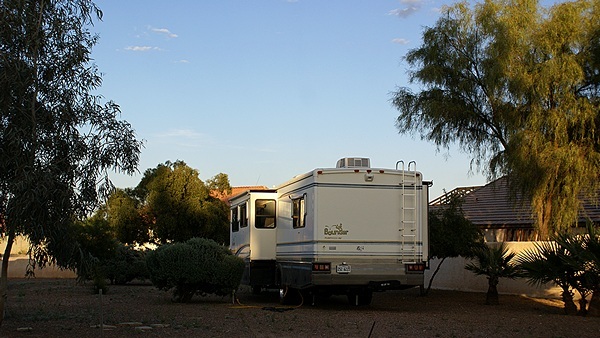 We drove to Arizona City and boondocked at the rental house of Curtis Coleman, founder and CEO of the RVillage social networking website for RVers. 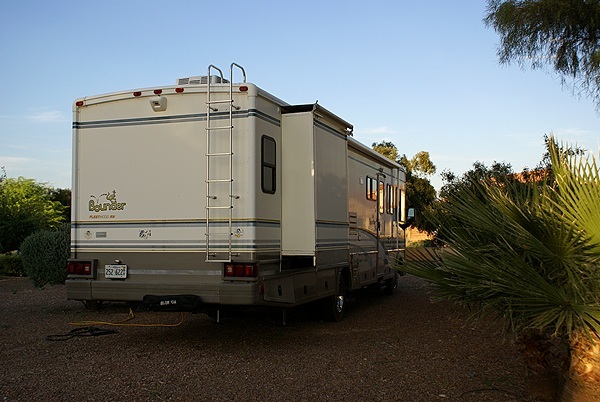 From there we relocated to an RV park in Tucson for a night and then went to the Escapees RV Club Escapade at the Pima County Fairgrounds where we worked very hard as event staff. After the Escapade we drove back to Arizona City with Lou and Val Petkus, stayed three nights, and then drove over to Why, Arizona for a week to visit Organ Pipe Cactus National Monument. The four of us then went back to Arizona City to decompress for a week and try to catch up on some computer/Internet-based work. While we were in Arizona City we managed to drive the Florence-to-Kelvin scenic road with Lou and Val Petkus, tour Frank Lloyd Wright’s Taliesin West (just the two of us), visit an Olive grove/mill (Linda and Val only), visit with fellow FMCA/SKP Freethinkers Larry and Orene Brown (me and Linda), and visit with Curtis when he was there as much as his work permitted. The daily high temperatures the last few days have been in the mid-to-upper 90’s while only a couple of hundred miles to the north they were just reaching 70 degrees F with lows at or just below freezing. Our Aqua-Hot is working better than our air-conditioners and we are ready to start moving east and north. Lou and Val pulled out today at noon for the short drive to Tucson and checked into the Prince of Tucson RV Park where we stayed for one night just before going to the Escapade. We will depart tomorrow and head to Deming, New Mexico, or thereabouts. From there we plan to head over to Las Cruces and up I-25 to Albuquerque where we will look for a full-hookup RV park for a few nights so we can explore the area a bit. From Albuquerque we will push on to Oklahoma City, Oklahoma to visit my only uncle. A long day’s drive from there will put is in an RV Park near Edwardsville, Illinois not far from where Linda’s sister (Marilyn) and her housemate (Linda) live and a reasonable driving distance from my sister (Patty), niece (Amanda), and her family. We plan to hang out in the area for a while if folks can make time to visit with us and keep an eye on the weather and road restrictions in southeast Michigan. Another day’s drive will put us at Butch and Fonda Williams’ place in Twelve Mile, Indiana; the place from which our two two-bus caravan departed for the southwest on December 3rd, 2014. We will likely linger there a few days and try to figure out what is going on with our two front air-conditioners. Once we leave there our final stop will probably be an overnight at the Turkeyville Campground south of Lansing, Michigan where we can dump our holding tanks in the morning before driving the last 80 miles to our house. With the hot temperatures have come bugs so we spent a long evening inside the house having a relaxed conversation with Curtis and getting to know each other better. It was the first time we have had a chance to talk to him without RVillage being the focus of the conversation. We opened the bottle of Black Currant wine we bought at the Forestedge Winery in Laporte, Minnesota in July 2013 and remembered why we bought it and why we brought it along. It was nice to share it with our new friend. We finally went back to our coach at 9:30 PM, had an easy, light supper, and went to bed. 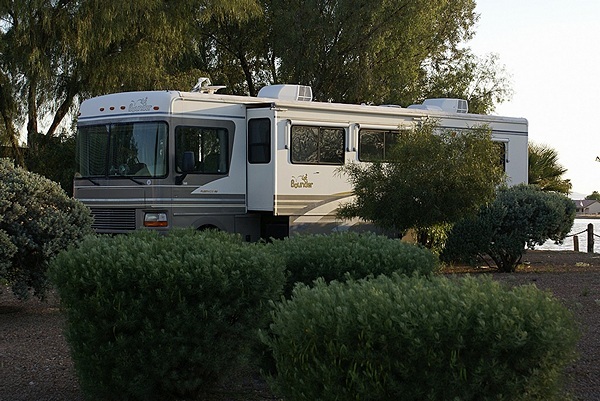 This entry was posted in Arizona, Escapade, Family-Friends-Home, Mexico, RV-Travel, WFPB, Wine, WordPress and tagged 55th SKP Escapade (2015), Anthem Communities (Florence AZ), Arizona City (AZ), Augie doggie (Curtis Coleman), Big Wa (Casa Grande AZ), Black Currant Wine (Forestedge Winery MN), Butch & Fonda Williams, Casa Grande (AZ), Curtis Coleman (RVillage), Discount Tire (Casa Grande), Florence (AZ), FMCA FTH Ch, haircut, Kung Pao vegetable, Larry & Orene Brown (SKPs/FMCA), Lou & Val Petkus, Moo Shu vegetable, Puerto Penasco (MX), Queen Creek Olive Mill (AZ), quinoa-kale salad (WFPB), Rocky Point (Puerto Penasco MX), SKP Ch 8 - Mexican Connection, SKP Freethinkers BoF, SKP Photographers BOF, vegan chili on 2015/03/31 by BRF.